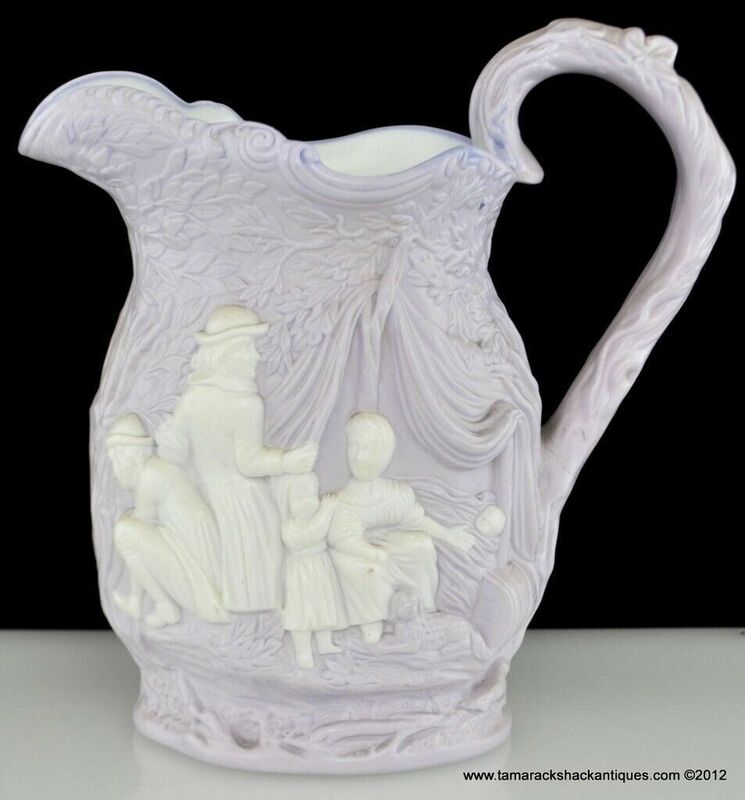 For your consideration is this Very RARE and Elegant 1840’s Parian Pitcher. This is by Samuel Alcock. This piece is a very nice Lavender Color that I haven’t seen in this type of pottery before. This Pitcher features a Witch and her Minion toiling over a cauldron on one side. The other side pictures a Gaggle of Wanderers with a Mother and Infant, a Young Lass, A Father and a Mystery Man along with the Family Dog. This piece is extremely detailed as seen in the background of leaves and branches along with the tent for the Wanderers, the Flames of the Fire and the gate of the fence. This Pitcher is also stamped with the Royal Coat of Arms on the bottom featuring the quote “Dieu Et mon Droit” and the number 107. This is truly a beautiful piece. A must have for the English Pottery collector. Please see the pictures for more details because any explanation I give will not do this piece Justice! Measurements – 9″ by 9″ by 5″. Condition – This piece is in Very Good condition. There are no chips, dings or repairs to this piece. There is a hairline crack around the base of the handle as well as a v shaped hairline on the top of the handle. The handle hasn’t been repaired.